Filmed around our beautiful rose gardens in Attleborough, Norfolk in early June. It looks set to be a fantastic year for roses and everyday more roses are bursting into bloom. The gardens are free to visit throughout the year. A range of garden tour packages are also available for groups. Please click here for more information on tours and events. Have you ever thought about growing roses in hanging baskets? Most roses will happily grow in a pot, provided that the pot is big enough and that they are watered regularly. 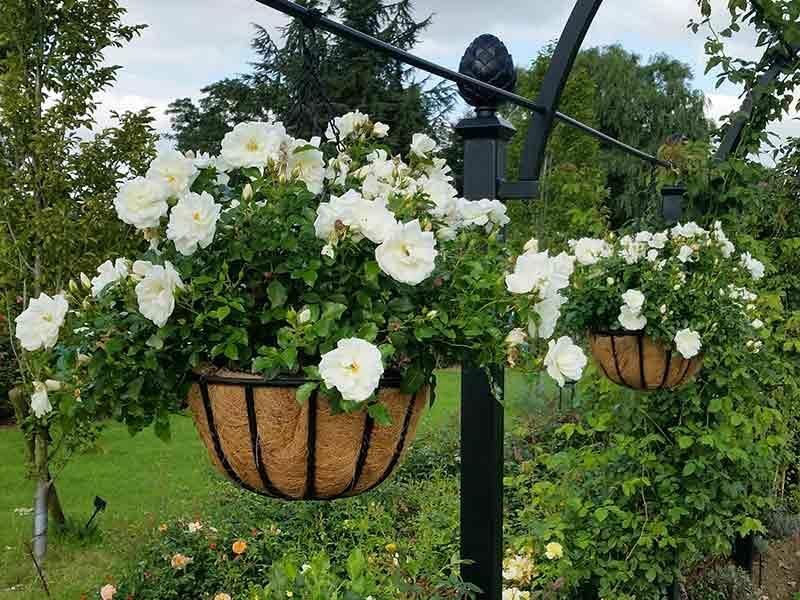 Something that a lot of people don't realise though, is that some roses can even be grown quite easily in hanging baskets. If you are thinking of growing roses in hanging baskets, then procumbent (ground cover roses) are best. This is because their growing habit is best suited to this environment, growing wider than they do tall as the roses mature the blooms will cascade over the top of your hanging basket. We would recommend using varieties like the Flower Carpet range; they are incredibly healthy and produce masses of bright, colourful flowers right through the season. If planting roses in hanging baskets then the most important thing to remember is to not let them dry out. This means watering them daily, when planting roses in this way always use bare root plants, a soil based compost and a slow release fertiliser to feed the plants throughout the season. Another top tip is to regularly feed the roses with Tomorite during the flowering season as this will help to produce more and more sumptuous blooms. Rambling roses, with their pliable stems, are perfect for training in a variety of imaginative ways. At Pashley Manor Gardens in East Sussex 'The Garland' has been trained to flow down the wall next to a flight of steps, creating a fantastic display of cascading flowers every summer. The above images demonstrate the importance of pruning and training your roses during the winter months. If you would like some advice on how to prune or train your roses then please have a look at our advice pages. Alternatively why not come along to one of our popular pruning and planting courses. Please click here for more information.